Well, I have found the perfect spot for you. We usually just go for Pizza Hut or Dominos... I mean you can get a pretty good deal at these two establishments and the pizzas taste....edible. Sometimes you want that authentic, traditional, cheesy pizza stacked with fresh ingredients. They don't have some uniform assembly-line esq method at TJ's Pizza House in Greenbank. You even get the added pleasure of watching your pizza being made right in front of you! What really sets this pizza place apart from the others for me is the 18 INCH FAMILY PIZZA. Its huge. The slices are the size of a dinner plate... I eat one slice and I'm full. 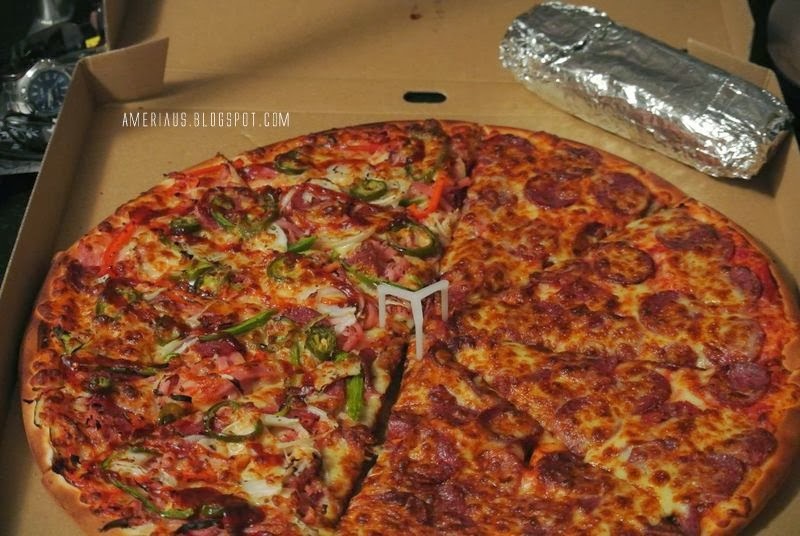 If you are having a little get together with 8 of your closest friends one pizza would be enough, haha. This pizza gets the gut seal of approval. For $30 bucks you can get a 18 in family pizza (half and half like the one pictured is an extra $1) , garlic bread and a drink. The trouble with venturing out and trying new pizza places is the risk! You pay a little more for a pizza at an independent only to find its dry and lacking flavor. I hate DRY PIZZA. This is a problem I have run into often when trying independent pizzerias. I am happy to say this was not the case with TJ's Pizza House.